In competition and in breeding, excellence and consistency will be rewarded. This was especially demonstrated throughout all the rounds at the World Equestrian Games – encompassing at least five rounds for the top 25, and six rounds for five of those horses due to a jump-off between the Americans and Swedes in the team competition. Who better to discuss consistency with than a person who has been involved with the sport for decades? 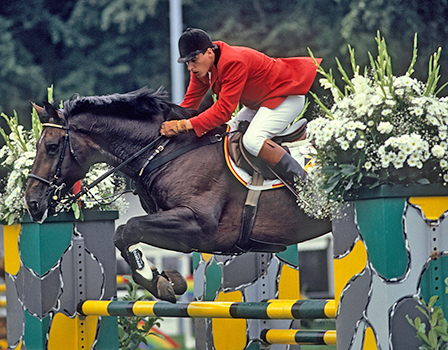 Nelson Pessoa was the 1966 European Champion, and, who, in the 1992 Olympics, was the oldest rider (age 56) while son Rodrigo was the youngest (age 19). Nelson also did the early training and competing on Baloubet du Rouet before handing over the reins to Rodrigo, who then piloted the chestnut stallion to numerous championship successes. About consistency of type, Nelson Pessoa made the following comments: “Nowadays, with the development of the breeding, we have quite a similar conformation horse. Before, the horses were very different. The conformation model for showjumpers is more equal now – from all different breedings – they are lighter. Of course, for the jumper we like to have the best and the strongest hindquarters and the most scope. Next articleThe exceptions and the rules!